Through nearly 150 years, a system of bridges has been built across the Niagara River near the famous falls that cross the American-Canadian border. The effort to bridge the two nations began in the mid-1800s and continues to this day; in total, 15 structures have been created, though some did not stand the test of time. Collapses caused by natural forces plagued many of the early structures. Those that stand today include the Peace Bridge (steel arch), the International Railway Bridge (iron truss), the Rainbow Bridge (steel arch), the Railway Steel Arch Bridge, Whirlpool Bridge (spandrel-braced arch), and the Queenston-Lewiston Bridge (steel arch). 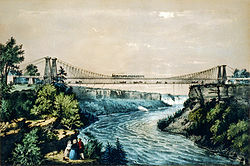 In 1846, permission from the Governments of Upper Canada and the State of New York allowed the formation of the Niagara Falls Suspension Bridge Company and the International Bridge Company of New York to jointly build and own the first bridge crossing. They chose the site along the Niagara Gorge above the Whirlpool Rapids, which was the narrowest point from shore to shore. John A. Roebling was the engineer of this pioneering bridge design. In 1896, the Railway Suspension Bridge was replaced by steel arch structure that could better handle the increasing weight and frequency of rail traffic. Steel pylons, beams, and trusses replaced the original wood and stone. The anchorages and cables from the original bridge were upgraded and served as the sole reminders of the previous Roebling design. After 10 years of use, the new bridge was again replaced by a more durable steel arch structure. The Lower Arch Bridge, renamed the Whirlpool Rapids Bridge in 1939, was constructed in 1897. The two-hinged spandrel-braced arch structure proved capable of handling greater loads than originally anticipated and is still in use today. In 1883, the Michigan Central Railway Cantilever Bridge was completed just south of the Whirlpool Bridge. The $700,000 structure was 910 feet long. The main span extended 495 feet, with 395-foot cantilevers from the abutments. This left a 120-foot gap, which was filled by a typical truss bridge, hung from the ends of the cantilever. The bridge was replaced after 40 years, by the Michigan Central Railway Steel Arch Bridge, to accommodate the weight of modern trains. It remains in use today.